Welcome to Summer and issue number thirty-six. This issue contains sixteen poems by nine authors, including several seminal and long-time contributors to The Commonline Journal. 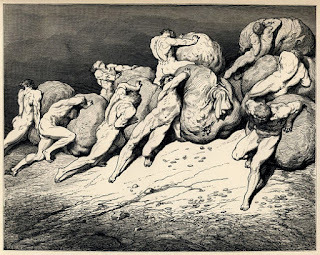 The cover "Hoarders & Wasters" is mirrored here from Dennis P. Wilken's recent collection Poetry Factory and originally rendered by Gustave Doré in 1857 as an illustration to canto VII of Dante's Inferno, wherein subjects condemned for greed push giant bags of money up a hillside in the fourth circle of hell. Try to enjoy yourself.